Home / Hustle / Interview / Trombone / A Day in Life as a Professional Trombone Player with Ben Weisiger! 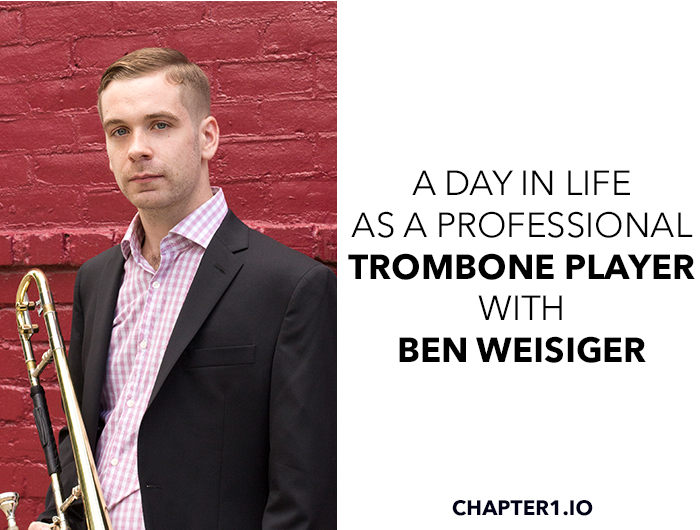 A Day in Life as a Professional Trombone Player with Ben Weisiger! This week, I am going to switch it up a bit and interview one of the greatest hustlers I know in a completely different industry: Music. Ben Weisiger is a trombonist, composer, and educator based in Jersey City, New Jersey. Originally from Richmond, Virginia Ben started playing the trombone in his public school band program. In 2012, Ben received a scholarship to the Rutgers University Mason Gross School of the Arts to study with the legendary trombonist, Conrad Herwig. As a performer, Ben has played around the New York/New Jersey area in a variety of settings from straight ahead jazz to musical theatre. Ben has toured extensively as a musician on cruise ships, playing shows from destinations in Europe to the Caribbean. He has also toured with the New York Youth Symphony Jazz band on its first international trip to Brazil. Most recently, Ben has been performing with the indie rock outfit, Bon Iver. Let’s start from the beginning. When and how did you get started? Was the trombone always your main instrument? When I was nine years old, my mom signed me up for piano lessons. My older brother was taking lessons at the time, so my mom signed me up as well. I had no interest in learning the piano at that age in my life. Against my will, I took piano lessons until I was old enough to start playing an instrument in the sixth grade band. By that point, I had heard a recording of Louis Armstrong and decided I wanted to play the trumpet like he did. Also, in my naiveté, I thought the trumpet only had three notes because there were only three buttons on it! I tried playing the trumpet in school for a day, but it was very hard for me. I couldn’t make a sound and it made my head hurt. One of the teachers came over to me and asked if I wanted to play the trombone instead. Some of my friends were also playing the trombone, so I said sure. From that point I never really thought of playing any other instrument. However, I did start playing the piano again when I got older. It’s a very important instrument to have an understanding of, as it helps paint a clearer picture of harmony. I’m limited to playing one note at a time on the trombone, but not on the piano. That’s a very hard question because I have many. The first person who showed me how fun it could be to play an instrument with great prowess was my brother. He also showed me the importance of taking pride in one’s craft. In high school, he was playing the piano as well as classical percussion with great facility. I saw his level of dedication and must have decided I wanted to emulate. My other main sources of inspiration were my teachers. My first trombone teachers when I was growing up in Richmond, Virginia were Reggie Pace and Bryan Hooten. They showed me how the trombone was supposed to sound and exposed me to a bunch of music that I had never heard before. They were some of the first people to pique my interest in jazz. My other big source of inspiration was my teacher at Rutgers University, Conrad Herwig. He’s not only one of the greatest trombone players in the world, but a remarkable teacher. He taught me how to be disciplined in my practice and to never give up. He’s one of the hardest workers I know and is a constant source of wisdom and guidance. When did you realize that you wanted to be a professional musician? I don’t think there was ever a specific moment that I made the conscious decision to make playing music my livelihood. I think it was just a series of events that put me on the path I’m on now. I wasn’t serious about playing the trombone until I was about fourteen. The first few years that I played my instrument, I used it as a means to be in band class. That’s where my friends were, and that’s where I wanted to be. It was a social scene. I didn’t practice too much, and I was interested in other things, like playing baseball. I remember the day when I was fifteen that I realized music was something I could do for my whole life. I started taking private trombone lessons for the first time. I was also doing marching band and jazz band at school. I really enjoyed those activities, and band started to become the most important thing in my high school world. That’s when I started to focus on playing music and practicing. However, even then I didn’t think about playing music as a source of income or as a necessity in my daily life. It was just something that started to interest me and I’ve been rolling with it ever since. The more I learn about music, the more I realize I don’t know. Music is really a lifelong pursuit, and that’s one of the reasons I’ve stuck with it. What are some of the greatest challenges that you encounter within the music industry? It’s hard to know where the next paycheck will come from. A lot of performing musicians work other music-related jobs to be financially stable. Teaching private lessons, or in schools and universities, is common. Some musicians also enter the world of arts administration, where they oversee some facet of the business end of an arts organization (e.g. working at Lincoln Center). It’s more consistent work. Musicians have other day jobs, too (I drive for Uber on rare occasions lol). Only making money from playing your instrument is hard. I worked on cruise ships for about a year and a half so I could save money and have a steady paycheck for a while; however, the down side to that gig is that you’re away from any sense of a city music scene, like New York. You’re in the middle of the ocean. I kind of liked that aspect because I was able to practice with minimal distractions every day. Also, traveling the world is a nice bonus. It was very hard because I wasn’t making any new connections that could realistically lead to more gigs back home. I was playing in the ship’s main band with musicians from all over the world. I learned about cultures that were different from my own, and got to play a wide variety of music that I was not previously exposed to. Those were invaluable experiences; however, when you go away for a while, musicians that are working on land can’t call you because they know you’re not around for a gig. My phone was quiet every time I got back home from working on the ship. I would gradually start picking up gigs again on land, but then I would leave back for the ship again. I’ve since moved on from that job, and it feels great. Working on cruise ships was a personally challenging experience for these reasons. It was a good first gig after college, though. I graduated, and a week later was flying to Venice, Italy to start playing on the ship. When I’m home, I’m always trying to see live music or play music with friends. It feels so refreshing to play with them because I know what it’s like to be deprived of it for months at a time. As a freelance musician how do you line up your gigs? I think one of the most important things for getting gigs is just being out on the music scene to begin with. People need to know that you exist in the first place. Depending on the size of the gig, people know who attend their shows. Getting gigs seems to be a combination of your ability on your instrument, who you know, and how easy you are to work with (either as a bandleader or supporting member). It’s also important to try and forge your own way. This could mean cold-calling fifty restaurants or bars and asking them if they have live music or need it. There are all different types of gigs. They could be teaching, playing, composing, arranging, and many more. Overall, the most important thing is casting a wide net because you never know where the next gig will come from. At this juncture, I try not to turn down any work that’s offered to me. You never know what it could lead to. At some point, I’ll hopefully be able to turn down some gigs that are less ideal, but for now, I’m trying to do everything that’s available to me. As follow-up, there are many musicians who play the same instrument. While in other industries like computer science where you interview your tech skills into employment, I find that music is quite different. How do musicians differentiate from one another to constantly stay marketable? What do you think is the most important thing to stay relevant within the industry? I don’t like to think of it as trying to differentiate myself from another player. I prefer to just stay true to myself when I play and give a personal, sincere effort every time. I think people respond to that more than anything else. Someone once told me to try and appeal to the humanity in the room. I like that. Musicians can however differentiate themselves from one another through reliability and professionalism. This means showing up on time, being prepared, and being easy to work with. This is true of any type of work and music is no exception. If someone calls me for a gig, I don’t want them to worry about whether or not I’ll be there on time. These things matter and can make a difference in getting work or not. Instead of calling you a Jazz Trombonist, I feel as if it's more appropriate to use a broader term such as, “Professional Musician”. You play music other than Jazz such as playing Indie Folk/Chamber pop genres with Bon Iver. Was this (playing music that’s not jazz for your gigs) intentional or more of like a by chance kind of moment? How often do jazz musicians play music that are not jazz for their gigs? While jazz was and is my first musical love, I try to be well rounded in all styles that I can be. I love Salsa music, Brazilian music, Rock & Roll, Hip-Hop, and many other styles. I’m happy to play or listen to most anything of good quality in hopes of becoming the best well-rounded musician I can be. The underlying theme is my love of playing the trombone. Jazz is so much fun, but it’s common for people to stray outside of the niche for gigs. When I was first starting, I was encouraged by my teachers to listen and play all types of music. The most important thing at the time was just learning to play my instrument, and any vehicle for playing, regardless of musical style, would be beneficial. I was focusing on jazz, but was also checking out other stuff. Classic Rock was the first music that I really liked listening to. I’m not trying to be strictly a “jazz head,” but rather, a trombonist capable of fitting into a variety of musical situations. Luck is the marriage of preparation and opportunity, so when I was asked if I wanted to join the trombone section of Bon Iver, I didn’t have to think about it for a second. I said yes immediately. I want to focus more on writing original music and arranging songs I like for a group of my own. I don’t really have my own band at the moment, but I would like to work on getting more of that together soon; however, there are a lot of musicians that I play and jam with frequently. They’re some of my best friends. I think it would be cool to take the playing that we do in the comfort of our homes and present it to people at bars, venues, etc. I also want to start teaching trombone lessons on a more regular basis. I haven’t taught in a while, and would like to get back into it. I feel like teaching young trombonists good technique on the instrument will only help to improve mine. What are some words of advice you would give to an aspiring professional musician? Stick with it. It’s not a race, but a marathon. I’m finding this out more and more every day. My teacher, Conrad Herwig used to frequently reference the teachings of the iconic American Football coach, Vince Lombardi. He would always tell us that through discipline comes freedom. I think what he means is that if you’re diligent in your practice and study of music, or anything else for that matter, you’ll create freedoms and possibilities for yourself that would not be achievable otherwise. If you want your startup to be interviewed or have any inquiries, please reach out to me at contact@taehongmin.com. Thank you for reading!